Anne Fogarty, spring 1967: linen culotte ensemble. York, 1950-57; designer, Saks Fifth Avenue, 1957-62; managed own business, Anne Fogarty, Inc., New York, 1962-74; lines included Anne Fogarty Boutique, Clothes Circuit, Collector's Items; closed business, circa 1974; freelance designer to 1980; final collection designed for Shariella Fashion, 1980. Awards: Coty American Fashion Critics award, 1951; Neiman Marcus award, 1952; Philadelphia Fashion Group citation, 1953; International Silk Association award, 1955; National Cotton Fashion award, 1957. Died: 15 January 1980, in New York. Wife Dressing: The Fine Art of Being a Well-Dressed Wife, NewYork, 1959. Williams, Beryl, Young Faces in Fashion, Philadelphia, 1956. Roshco, Bernard, The Rag Race, New York, 1963. "Fogarty Was Ahead of Dior," in Life, 31 August 1953. "Anne Fogarty," in Current Biography (New York), October 1958. "Anne Fogarty," [obituary] in the New York Times, 16 January 1980. "Anne Fogarty," [obituary] in Current Biography (New York),March 1980. Buck, Genevieve, "All Dressed Up and a Place to Go: Film Costumer's Lincoln Avenue Store Brings Back a Trendy Time," in Chicago Tribune, 15 December 1994. Anne Whitney Fogarty designed the American look, creating clothes that were youthful, simple and stylish. Although Fogarty studied drama at the Carnegie Institute of Technology in Pittsburgh, Pennsylvania, her real love was for the costumes she wore. Moving to New York she worked as a fitting-model for Harvey Berin while looking for acting parts. When she received an acting job, Berin encouraged her to think about becoming a stylist instead, and in 1948 Fogarty began designing clothes for the Youth Guild. Youth Guild's market was teenagers, who were perfect for the narrow waist and full skirts of the "New Look," a style Fogarty used. In 1950 Fogarty began designing junior-sized clothing for Margot, Inc. She still favored the "paper-doll" silhouette for both day and evening wear, with its full skirt, narrow waist, and fitted bodice. To help create the shape, she adopted the idea of crinoline skirts from the Edwardian age. These stiffened petticoats made of nylon net, frilled or trimmed in lace, helped hold out the skirt and Fogarty encouraged wearing two at a time to enhance the silhouette. She herself had an 18-inch waist. Fogarty wrote a book called Wife Dressing in 1959, a guide for "the fine art of being a well-dressed wife with provocative notes for the patient husband who pays the bills." In the book she recognized that women led varied lives working, as students, wives, and mothers, and encouraged women to find their own style and color—recommending an understated, natural look that did not slavishly follow the fashion of the day. Fogarty continued to design for Margot, Inc., and eventually for Saks Fifth Avenue. In 1962 she opened her own business, Anne Fogarty, Inc., and added misses' sizes to her line of clothes. Although she began with full skirts, and fitted bodices, she adapted her designs to suit the times. After the paper-doll silhouette came the tea cozy dress in which the full skirt fell from a dropped, rather than natural waist. She used a narrow silhouette without fullness, the Empire line, with its emphasis on the bust line, and she introduced the "camise," a chemise which fell from a high yoke. Fogarty designed separates and long dresses, quilted skirts over hot pants, and mini skirts. She produced designs in a peasant style, blouses with ruffles, long skirts with ruffled hems, and ethnic styling. Whatever the silhouette or fashion type, her interpretation was youthful, with details like puffed sleeves and round collars. 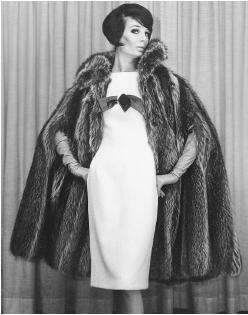 Anne Fogarty, fall 1964 collection: wool dress with a satin pull-through bow under a raccoon fur cape coat. was selected as one of the Young Women of the Year by Mademoiselle magazine. In 1951 she received a Coty award for dresses and in 1952 the Neiman Marcus award. Although she closed her own business in the 1970s, Fogarty continued to design. She finished a collection for Shariella Fashion in 1981, just months before her death in January 1981. During her career Fogarty worked with a variety of silhouettes and fabrics, in a broad range of sizes. She was a prolific designer who was able to adjust to a changing market, responding with designs that typified the all-American look.